Exterior of the impressive Burrow Hall in Lancashire. © By Karl and Ali, CC BY-SA 2.0We are proud to say that our work occasionally sees us nominated for awards and / or mentioned in industry press articles. In 2015 William Wilson Architectural Mouldings Ltd were commissioned to work alongside a team of highly skilled specialists in restoring Burrow Hall, one of the finest surviving 18th Century houses in Lancashire. 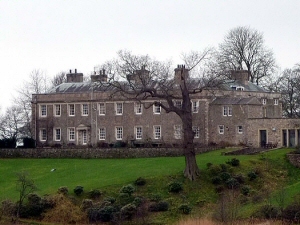 Burrow Hall and the other principal estate buildings fell into a poor state of repair until the current owners bought it in 2013. An extensive programme of alteration and restoration work began which included the careful repair and sensitive upgrading of the interiors, stonework repairs, the demolition of a modern glazed link between house and stables and the re-planning of the back of house areas. After extensive renovation to the plasterwork, we were delighted to be informed that Burrow Hall was awarded an architectural award in the Georgian Group of the National Architectural Awards. A fantastic achievement for everyone involved in restoring this magnificent building. For more information, take a look at the original article on the Georgian Group website: www.georgiangroup.org.uk. To keep up with our day to day activities, why not "Like" us on Facebook or "Follow" us on Twitter? We can supply, fit and restore in the news to homes, businesses and historic buildings in: Accrington, Barrow, Blackburn, Blackpool, Bolton, Burnley, Bury, Carlisle, Chester, Chorley, Cumbria, Fleetwood, Garstang, Kendal, Lancaster, Leyland, Lytham St Annes, Morecambe, Oldham, Poulton-le-Fylde, Preston, Skelmersdale, Southport, Thornton-Cleveleys, Ulverston, Warrington, Widnes, Wigan, Wilmslow, Windermere, Wirral, and more!